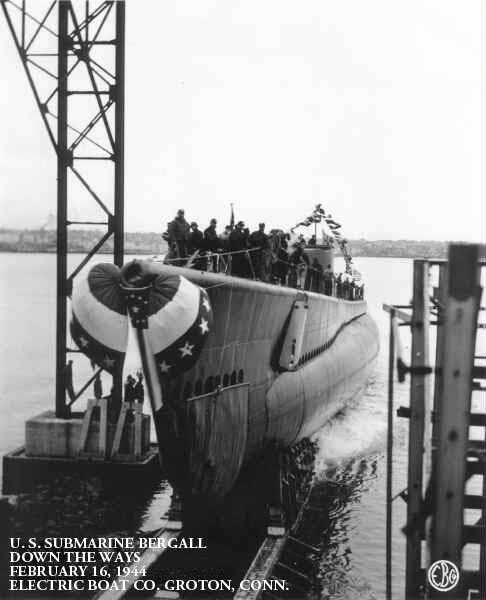 Balao Class Submarine: Laid down, 13 May 1943, at Electric Boat Company, Groton, CT.; Launched, 16 February 1944; Commissioned USS Bergall (SS-320), 12 June 1944; Decommissioned, and transferred, on loan to Turkey, 18 October 1958. 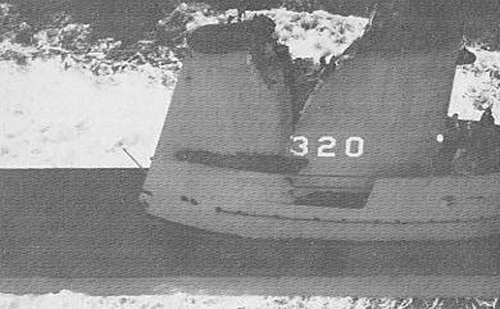 While on patrol, she suffered damage aft from mine explosion off Malay coast and put in for emergency repairs at Subic Bay, Luzon. Between August and December 1945, she was permanently repaired at Portsmouth Navy Yard. In 1952, Bergall partly received the GUPPY (snorkel) conversion at Philadelphia Naval Shipyard. Removed 4 main motors and reduction gear & added 2 direct drive main motors, but did not complete the GUPPY process and remained a Fleet Snorkel boat through 1954. On 15 October 1958, Bergall arrived in Izmir, Turkey and Decommissioned 2 days later.Transferred (lease) to Republic of Turkey under terms of Military Assistance Program, she was Commissioned TCG Turgutreis (S-24) 17 October 1958 and on 1959 accordance with the NATO pendant system, renumbered TCG Turgutreis (S-342) (note: named after an Ottoman Navy commander who conquered Corsica and was later killed while attempting to take Malta in 1595). 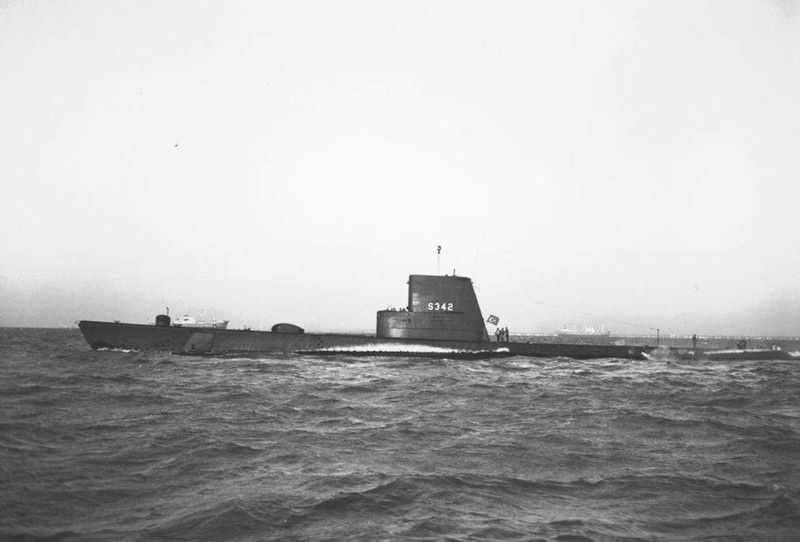 The ship lost her name on 22 March 1965 (Bauer) in favor of SSN-667 Bergall ordered on 9 March 1965. She made a return visit to the United States at Philadelphia Naval Shipyard. Phila, PA. USA 1974. Struck from U. S. Naval Vessel Registry on 1 February 1973, the exBergall was permanently transferred (cash sale) to Turkish government. 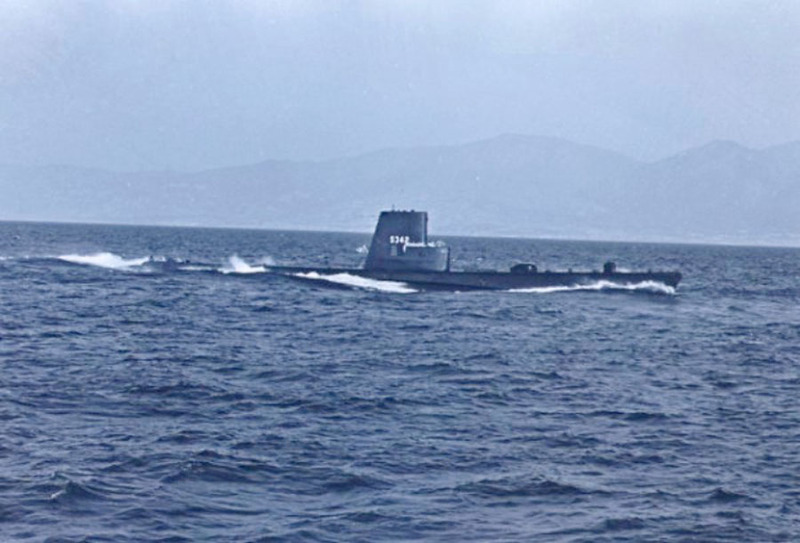 Turgutreis (S-342) was one of several ex-USS submarines that participated in the Turkish Navy's Cyprus Peace Operations in 1974. 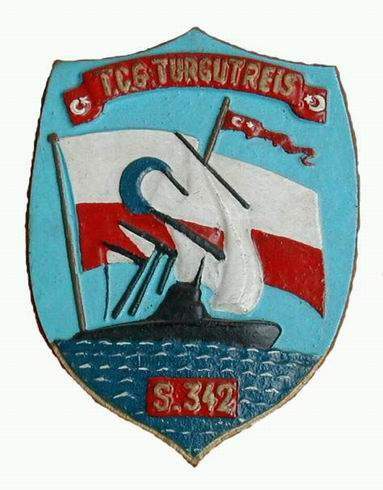 Turgutreis (S-342) Decommissioned from the Turkish Navy on 5 April 1983; re-named Ceryah Botu - 6 and acted as a receiving boat at Golcuk Navy Yard, Turkey until being sold for scrap in 2000. Final Disposition, sold for scrapping in April 2000. 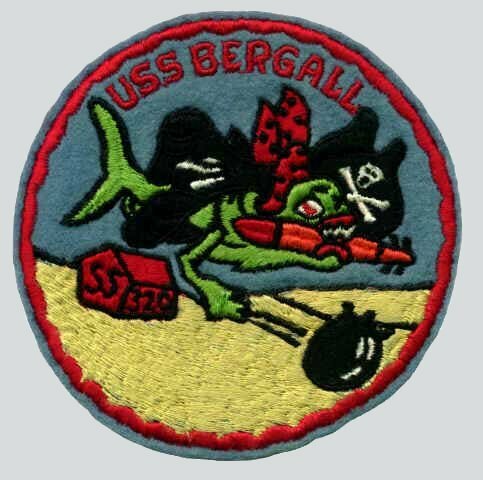 Bergall received four battle stars for her World War II service. 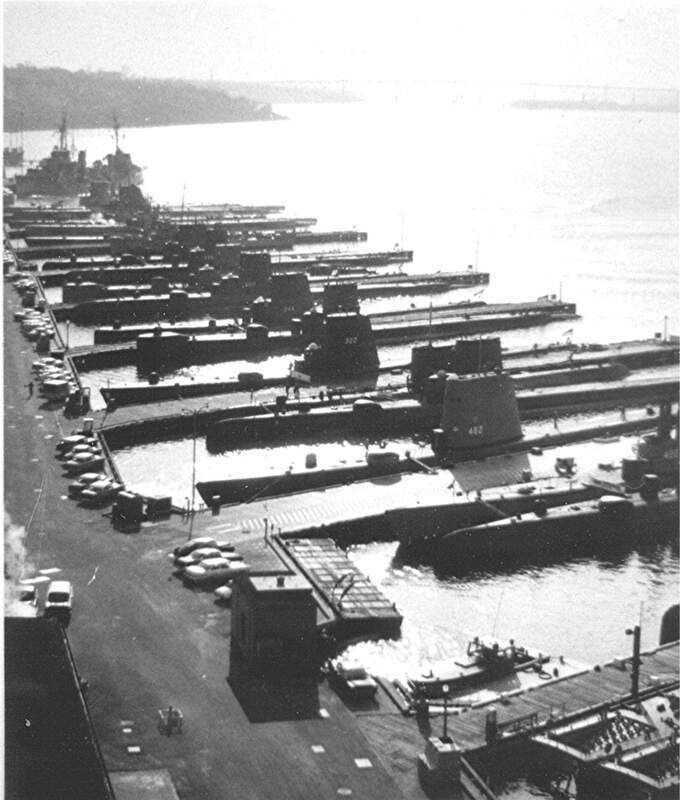 Researched by CTRC Donald J. Wagner, USN (Ret.) & Sait Kucuk, CPOS (Ret), Turkish Navy for NavSource. 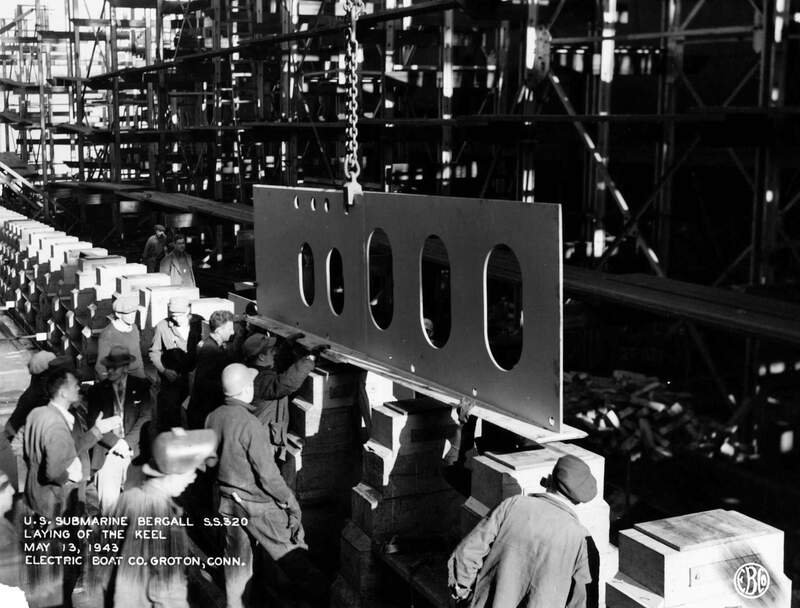 462k Keel laying of the Bergall (SS-320), 13 May 1943, at Electric Boat Company, Groton, CT. Electric Boat photo courtesy of Wendy S. Gulley, Archivist, Submarine Force Museum, Naval Submarine Base NLON, Groton, CT.
30k Commemorative post card on the occasion of the Bergall's (SS-320) keel laying, 13 May 1943, at Electric Boat Company, Groton, CT. Courtesy of Jack Treutle (of blessed memory). 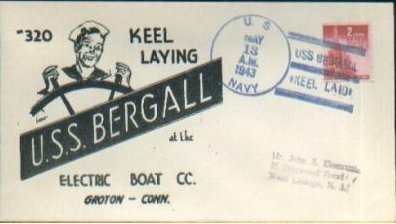 19k Commemorative post card on the occasion of the Bergall's (SS-320) keel laying, 13 May 1943, at Electric Boat Company, Groton, CT. Courtesy of Jack Treutle (of blessed memory). 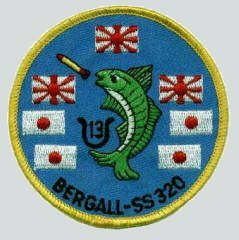 1.76k Bergall's (SS-320) sponsor Mrs. James. 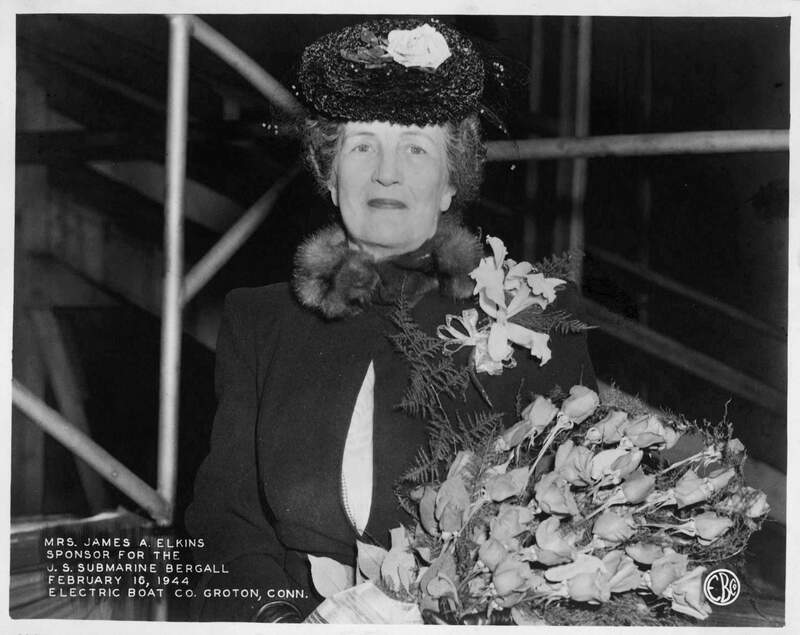 A. Elkins, at the boat's launching on 16 February 1944. 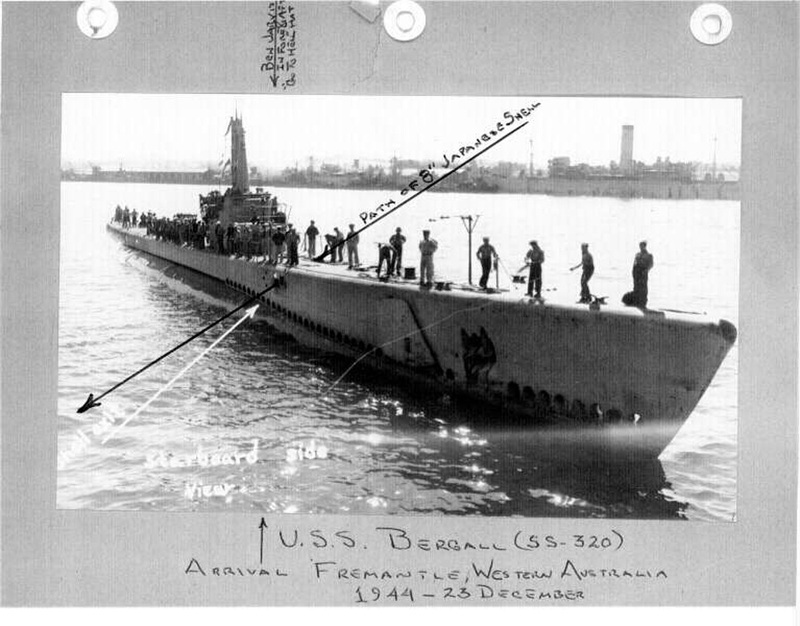 Electric Boat photo courtesy of Wendy S. Gulley, Archivist, Submarine Force Museum, Naval Submarine Base NLON, Groton, CT.
1.23k Bergall's (SS-320) sponsor Mrs. James. A. Elkins, Lieutenant Commander John. M. Hyde, son John Carr Hyde, & Mrs. John. 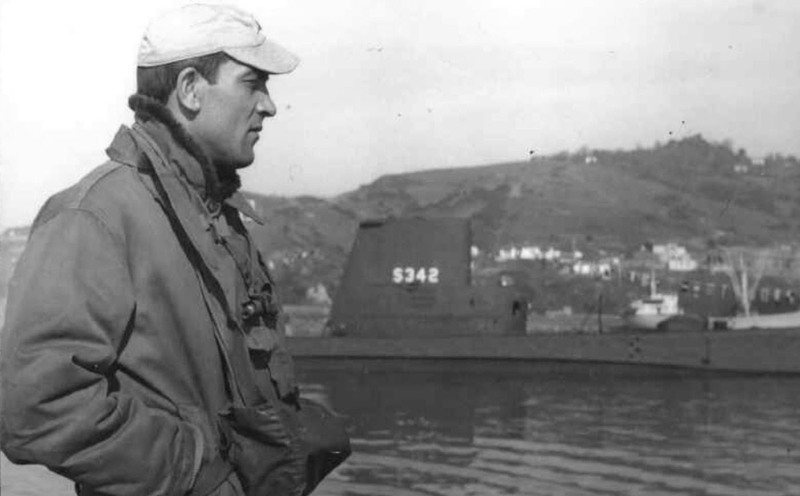 M. Hyde at the boat's launching on 16 February 1944. Photo courtesy of Electric Boat Co, courtesy of Mike Brood, bergall.org. 31k The Bergall (SS-320) slides down the launching ways at Electric Boat Co., Groton, CT., 16 February 1944. 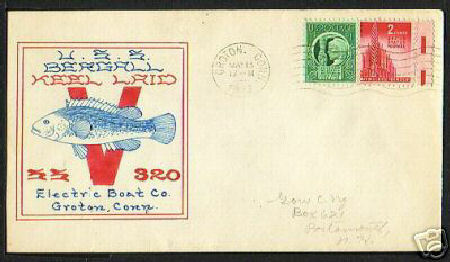 Electric Boat Co. photo, courtesy of Mike Brood, bergall.org. 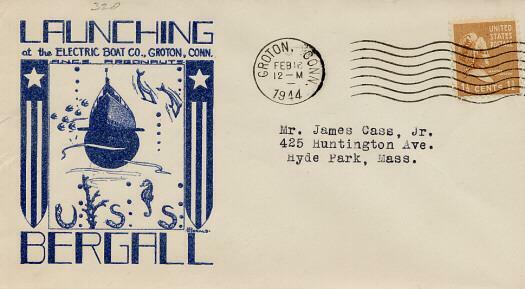 38k Commemorative commissioning post card of the launching of the Bergall (SS-320), 16 February 1944. Courtesy of Richard Leonhardt. 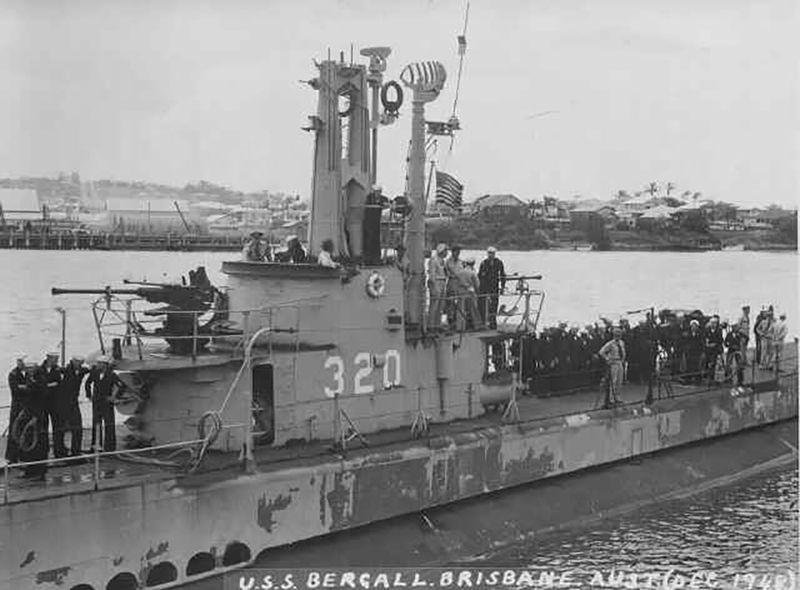 214k Bergall (SS-320) upon her triumphal return to Australia, 23 December 1944. The path of the heavy cruiser IJNS Myoko's dud 8" shell is clearly marked, having passed from port to starboard through the pressure hull. Photo courtesy of Robert Hurst. 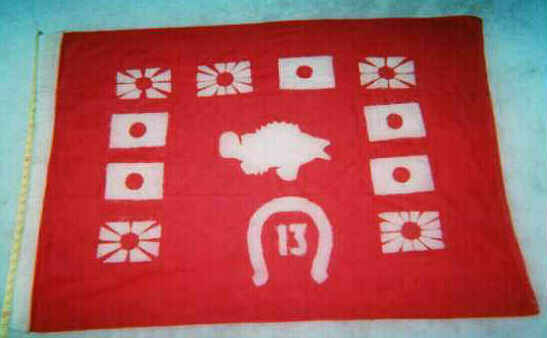 18k Bergall's (SS-320) WW II battleflag. Courtesy of Jack Treutle (of blessed memory). 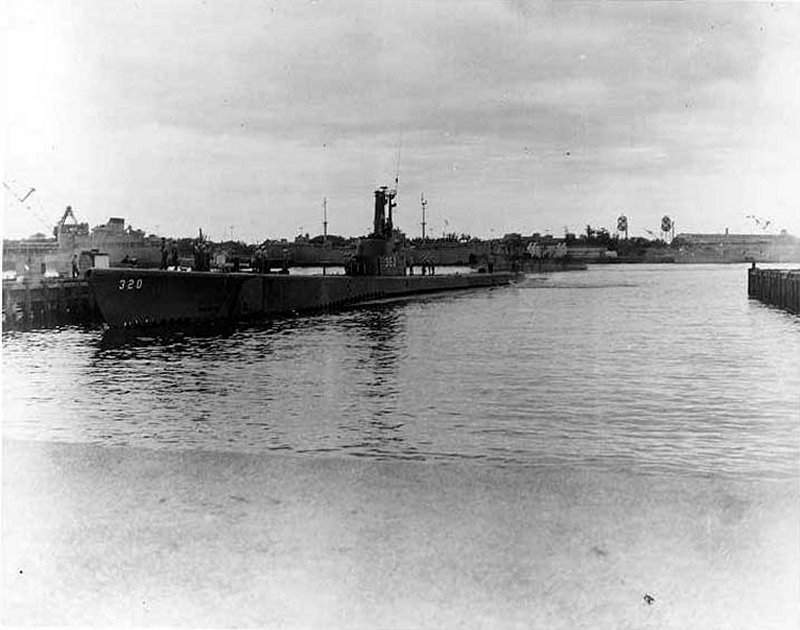 46k Bergall (SS-320), possibly at Pearl Harbor, circa post 1945. Courtesy of ussubvetsofwwii.org. 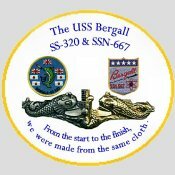 1.23k Ten page PDF history of submarine's named Bergall. Photos courtesy of Scott Koen & ussnewyork.com. 104k 3 photo PDF of the Bergall (SS-320), Besugo (SS-321), Caiman (SS-323) & unknown boat alongside their tender circa late '46 to early '47. Photo i.d. courtesy of Mike Brood. Photos courtesy of Steve Franklin. 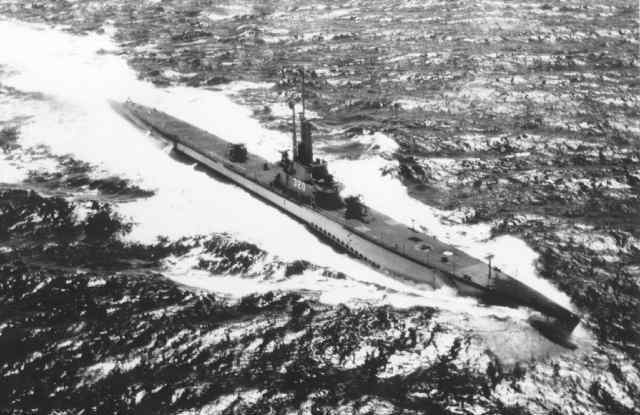 36k Bergall (SS-320), underway, circa 1947. USN photo courtesy of Mike Brood, bergall.org. 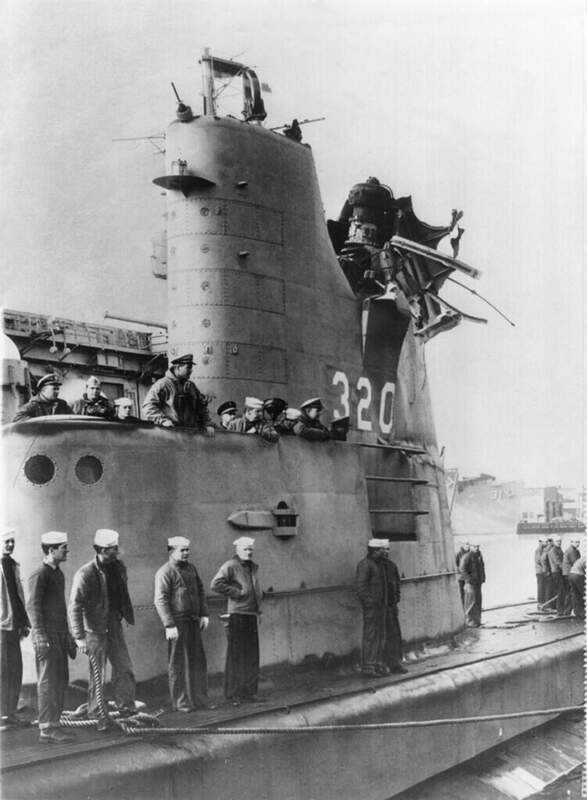 300k Following repairs Bergall (SS-320) rejoined the Pacific Fleet in December 1945 She remained on active duty with the Pacific Fleet until departing Pearl Harbor for the Atlantic 10 June 1950. During this time she made one cruise to the Far East (4 December 1948-28 February 1949). She is pictured here in Brisbane in December 1948. Photo courtesy of John Hummel, USN (Retired). 29k March 1950 in Hawaii. 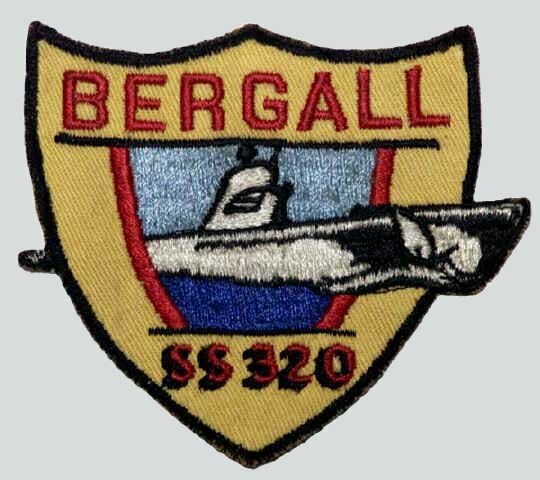 Bergall (SS-320) is outboard of the Caiman (SS-323). In the background is the Valley Forge (CVA-45). Text courtesy of John Hummel, USN (Retired). Photo courtesy of Grant Riddle / submarinebaseph.com. 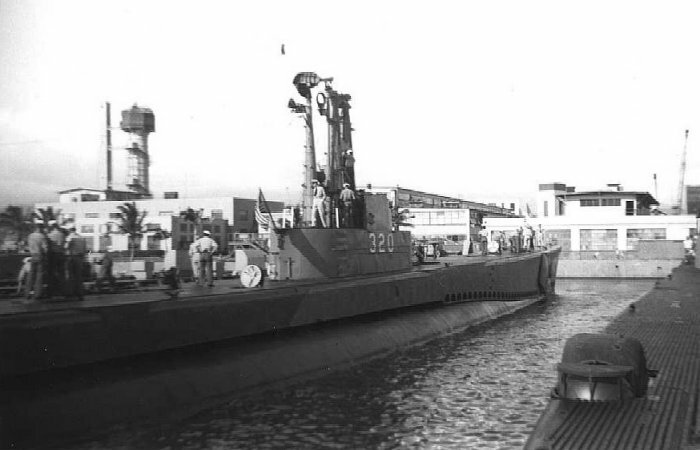 45k Bergall (SS-320), at dock in Pearl Harbor, HI., 1950. 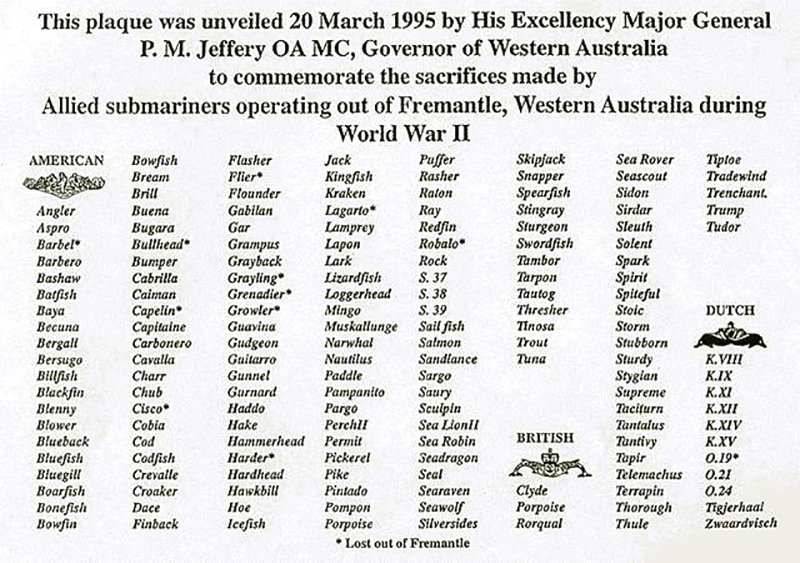 Courtesy of Grant Riddle & submarinebaseph.com. 460k Meet the XO and CO of the newly re-commissioned Fulton (AS-11). 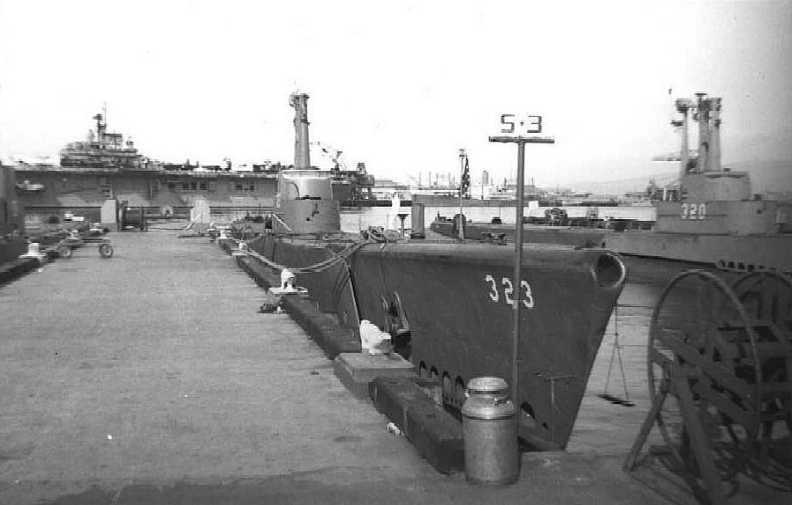 The photo was taken at Mare Island on 10 April 1951. 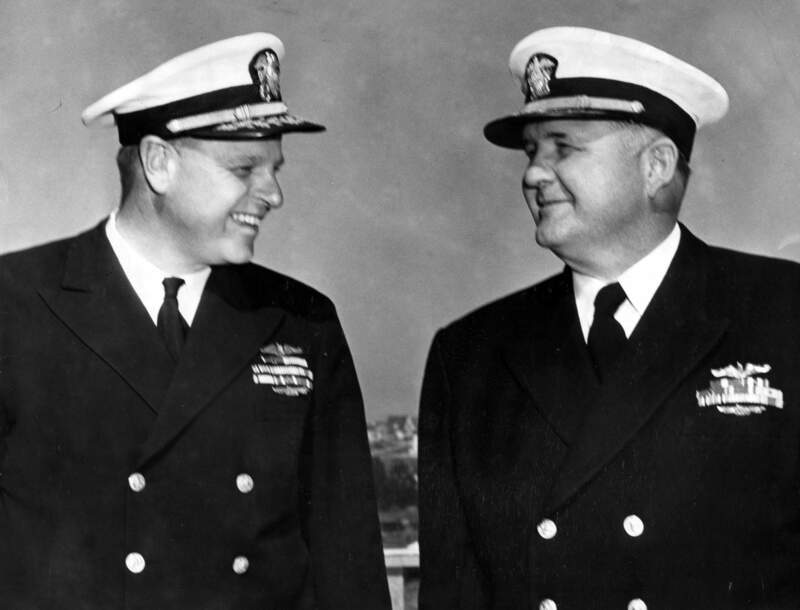 To the right is XO CDR Thomas H. Kimmel and left is the CO Capt. Victor B. McCrea. Both had interesting WWII experience: Capt. 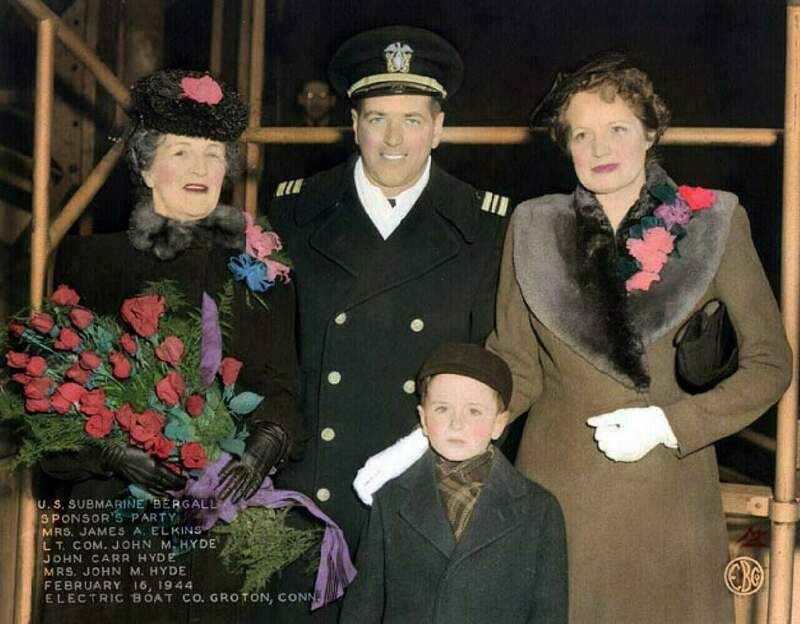 McCrea earned the Navy Cross as CO of the Hoe (SS-258) from 1/26/44 to 3/5/44 during her third war patrol. 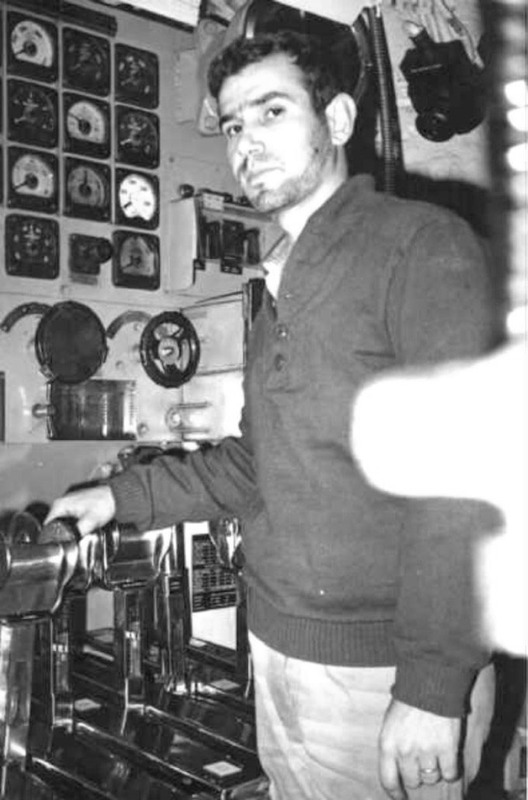 CDR Kimmel earned the Bronze Star with �V� as XO of the Bergall (SS-320) from 9/8/44 to 11/8/44. He later commands Bergall from 9/17/45 to 3/20/48. Photo courtesy of Vallejo Naval and Historical Museum via Darryl L. Baker. 79k Bergall (SS-320) in 1953, when she was operated out of New London and conducted two training cruises to the West Indies, where she visited the Bahamas, Cuba, and Key West. USN photo, text courtesy of bergall.org. 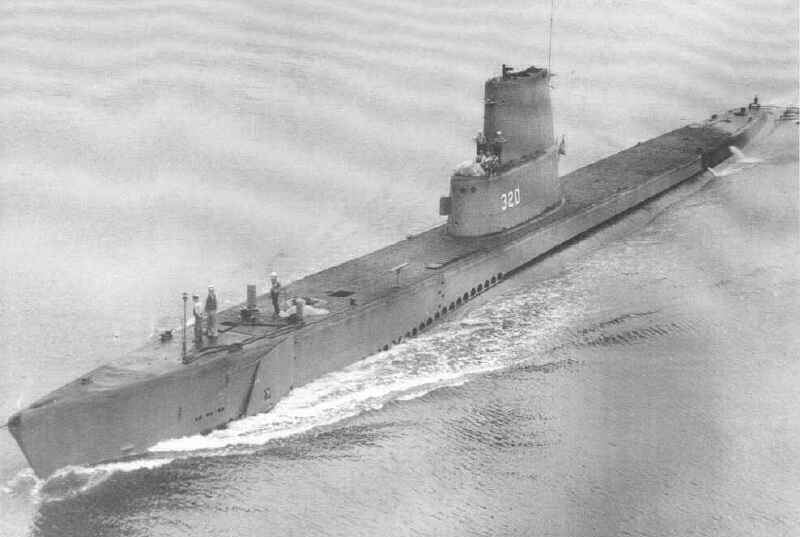 30k Bergall (SS-320), underway, circa 1950 before Snorkel conversion, and here in 1954, after Snorkel conversion. USN photo courtesy of Mike Brood, bergall.org. 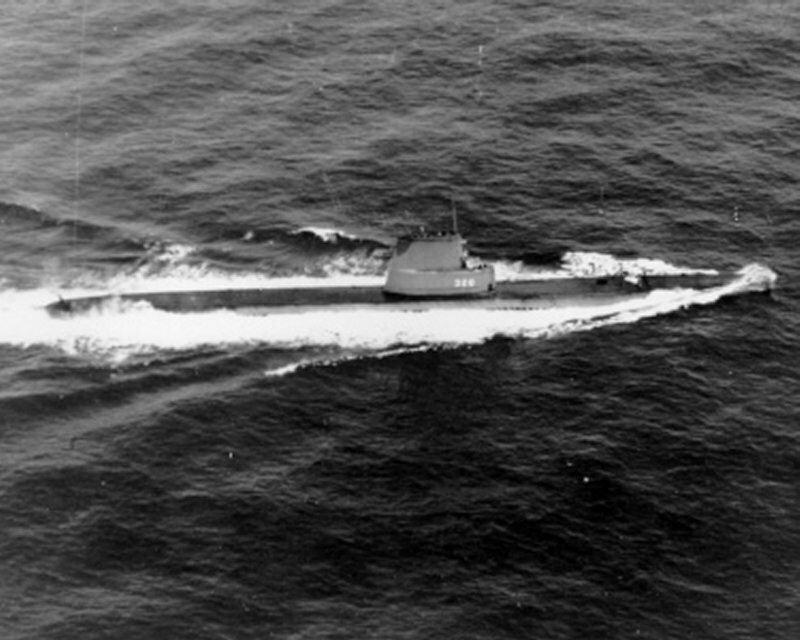 608k Bergall (SS-320) as a casuality on 2 November 1954, following exercise Lantflex off the coast of Cape Hatteras. She is seen here on Halloween, 1954. Photo and text i.d. courtesy of Mike Brood, bergall.org. Insert photo courtesy of Scott Koen & ussnewyork.com. 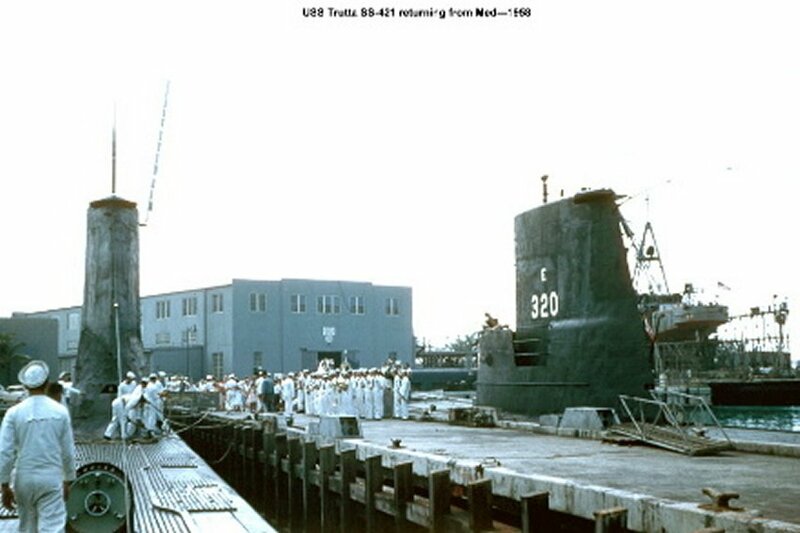 65k Trutta (SS-421), & Bergall (SS-320), dockside in Florida, home from Med Cruise 1958. Photo courtesy of Jack Treutle (of blessed memory). The rest of the subs are too far away for positive identification. Text courtesy of Dave Johnston (USNR) Photo i.d. courtesy of Mike Brood. 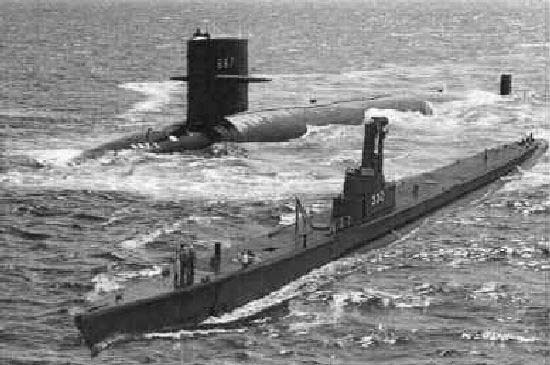 USN photo courtesy of Submarine Force Library, courtesy of Ken Hart. 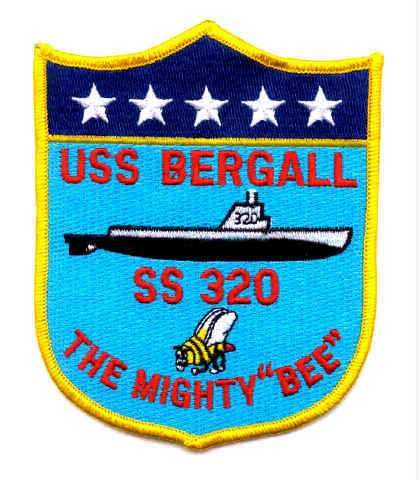 101k The Bergall (SS-320), drawn by the renowned graphic illustrator John Barrett with the text written by naval author and historian Robert F. Sumrall. Their company Navy Yard Associates offers prints of most destroyers, destroyer escorts, submarines and aircraft carriers in various configurations during the ship's lifetime. The prints can be customized with ship's patches, your photograph, your bio, etc. If you decide to purchase artwork from them please indicate that you heard about their work from NavSource. Photo courtesy of Navy Yard Associates. 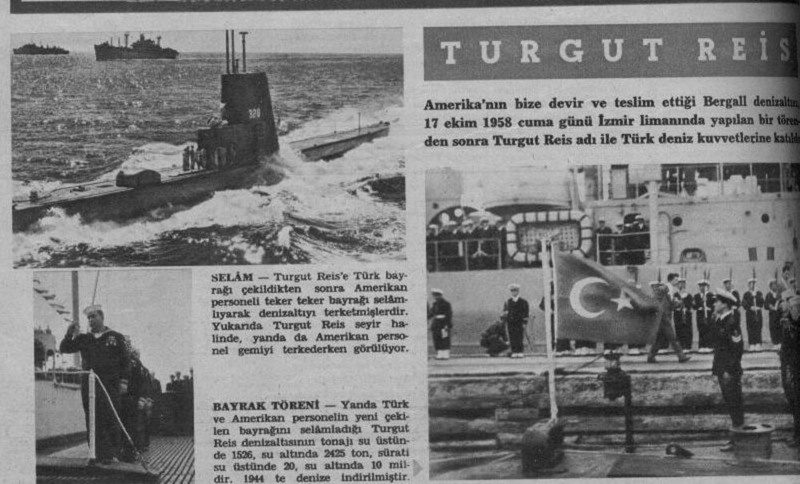 133k Montage of photos showing Turkish sailors saluting their flag during transfer ceremony of the ex-Bergall (SS-320), as the Turkish Turgutreis (S-342) on 18 October 1958. Photo courtesy of C�neyt Demir. 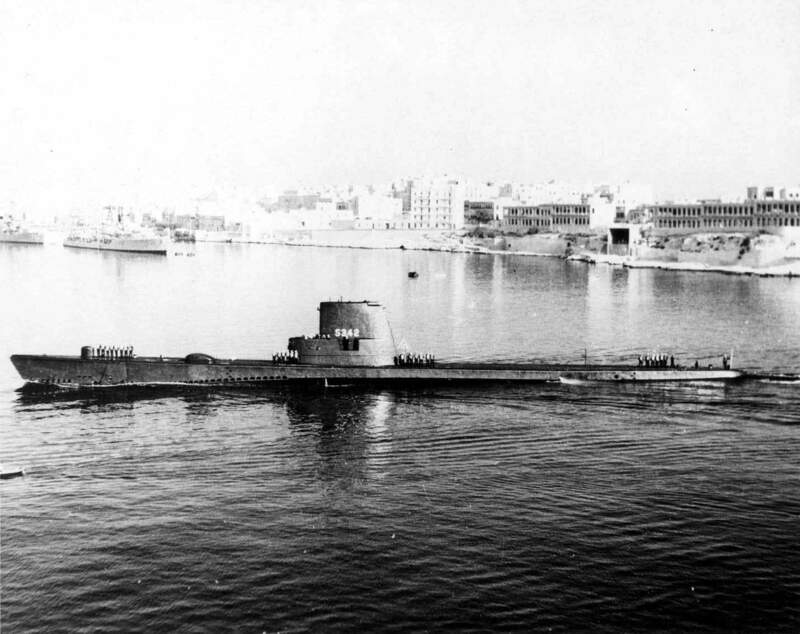 159k ex-Bergall (SS-320), as the Turkish Turgutreis (S-342), at Valetta, Malta in 1962. Courtesy of ussubvetsofwwii.org. Photo i.d. courtesy of Sait Kucuk, CPOS (Ret),Turkish Navy. 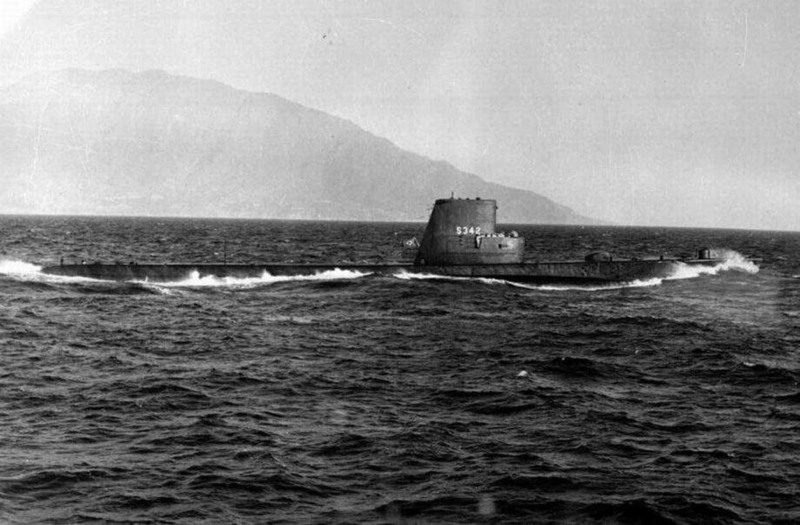 166k Turgutreis (S-342) off to participate in NATO exercises, 1963. Photo courtesy of Sait Kucuk, CPOS (Ret),Turkish Navy. 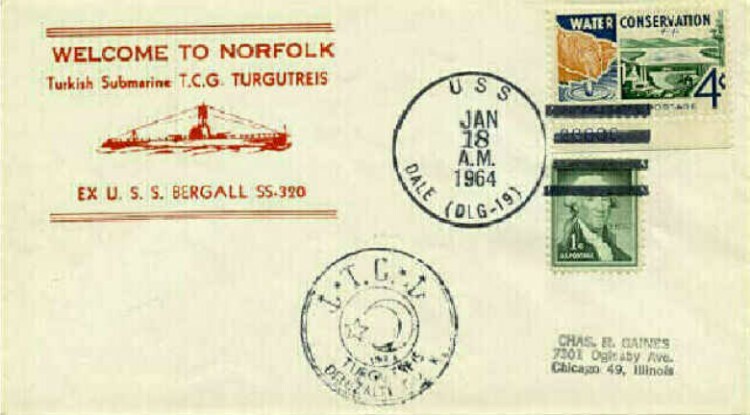 66k Commemorative post card on the occasion of the Turgutreis (S-342) visiting Norfolk, VA., 18 January 1964. Photo courtesy of Y.M.Umar,CPO (Ret. ),Turkish Navy. 101k Going to Exercise in Marmarean Sea, 1965. Photo courtesy of Sait Kucuk, CPOS (Ret),Turkish Navy. 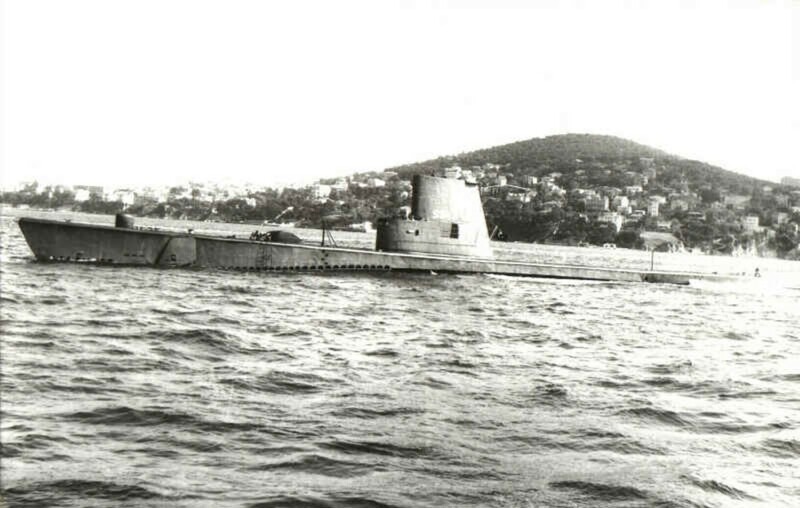 190k The Turgutreis (S-342) at a depth of 250 foot while in horizontal navigation (carefully look at the depth gauge). Photo courtesy of Y.M.Umar,CPO (Ret. ),Turkish Navy. 217k Turgutreis (S-342) in front on the Princess Islands (Heybeliada) in Marmara, (1975). Photo courtesy of Y.M.Umar,CPO (Ret. ),Turkish Navy. 104k Eregli Harbor in Black Sea, Hasan Alp ETCPO and left side Turgutreis (S-342). Photo courtesy of Y.M.Umar,CPO (Ret. ),Turkish Navy. 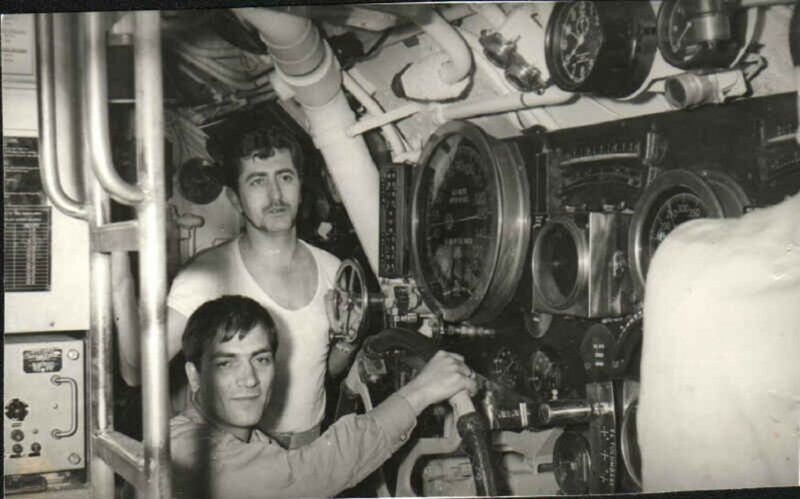 122k In the Turgutreis (S-342) Maneuvering Room. Checking controls. ( 1975 ) Suleyman Kurum ETC. Photo courtesy of Y.M.Umar,CPO (Ret. ),Turkish Navy. 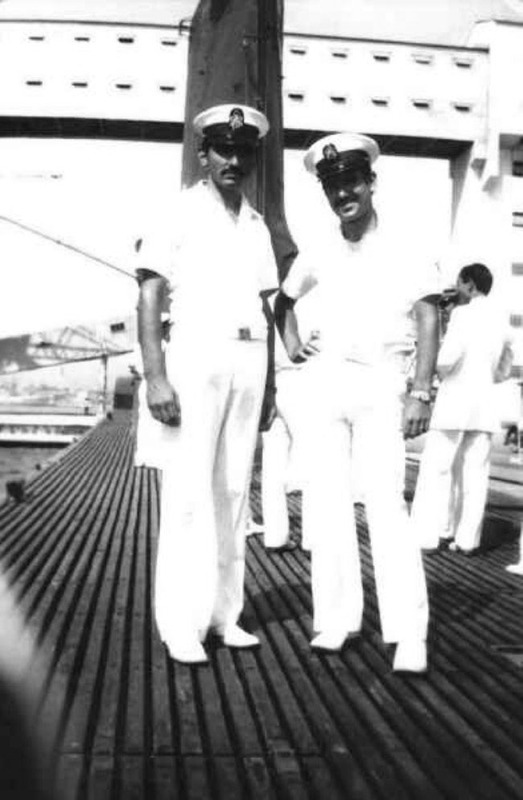 104k On the Aft Deck, Mersin Harbour, 1976 (Resting after Patrols for the peace operation on Cyprus) Suleyman Kurum ETC. Photo courtesy of Y.M.Umar,CPO (Ret. ),Turkish Navy. 96k Turgutreis (S-342) underway with the mountains of the Mediterranean in the background. Photo courtesy of Y.M.Umar,CPO (Ret. ),Turkish Navy.